Marin Medicine is on the press! Watch your mail later in November for Marin Medicine. 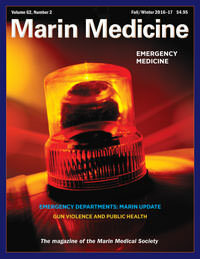 The fall/winter issue focuses on emergency medicine and features a special section with hospital reports on emergency care in Marin. Other theme articles include the ER, patient education and Kaiser's telestroke program. Departments cover a wide range of topics ranging from gun violence and public health to the fall House of Delegates. A Resources Spotlight offers tools and resources for solo and small group practices, and a photo spread from the MMS Awards Dinner rounds out the issue. Cynthia Melody, who celebrated 25 years with the Sonoma County Medical Association in October, has announced her departure effective Dec. 31, 2016. Initially recruited to manage SCMA committees, programs and projects, Melody has served as executive director since 2000. She's also served as executive director for the Marin Medical Society since 2007 and the Mendocino-Lake County Medical Society since 2010. The three boards of directors have several meetings planned to look at current organizational structures and consider options for 2017 and beyond. Click here to view Melody's departure letter. Marin General Hospital announced it has received the prestigious 2017 Stroke Care Excellence Award™ for the fourth consecutive year (2014-17) from Healthgrades, placing it among the top 10% of hospitals in the country for stroke care. More than 500 California physicians, representing 43,000 physicians statewide, convened in Sacramento last month for the 145th Annual Session of the CMA House of Delegates. The HOD meets annually to establish broad policy on current major issues affecting members, the association and the practice of medicine. This year's major issues were MACRA, maintenance of certification, opioids, physician burnout, ACA changes and public health. For more information on this years' HOD, visit www.cmanet.org/hod and view photos at www.facebook.com/cmaphysicians. Physicians who provide services to Medicare or Medi-Cal patients must comply with new nondiscrimination posting requirements effective Oct. 16. To answer questions regarding compliance, CMA has created an FAQ resource to help guide members. The U.S. Department of Health and Human Services Office of Civil Rights (OCR) recently released an updated "Guidance on HIPPA and Cloud Computing" for the storage or transmission of electronic personal health information (ePHI). If using a cloud service provider to maintain ePHI, a HIPAA-compliant business associate agreement is required to avoid a HIPAA violation. For more information, see CMA OnCall document #3301 "Physician Use of Mobile Devices and Cloud Computing." On-Call documents are available free to CMA members. To protect patient privacy, develop a written policy on camera and smartphone use in the office. See monthly tip sheet for details and reminders to practice managers and physicians about CMA benefits and services. 1,200 sq. ft. office available in Marin Medical Center, located two blocks from downtown San Rafael. Functional building designed as medical facility around beautifully landscaped central courtyard. Air-conditioned suite formerly occupied by orthopedic surgeon and general practitioner. Includes waiting room, reception/office, 4 exam rooms, storage closet, bathroom w/closet, small office and rear exit. Can be remodeled to suit. Rent just $3,300 per month, plus annual CPI. No other pass-through expenses. Owner prefers long-term tenant of 3 to 5 years. Owner responsible for all utilities, tenant for own janitorial. Contact Pierce Realty: Roger Pierce at 415-453-3540, Ext. 15 or rogerbiz@comcast.net.